Ex-Christadelphian Voice of Reason (ECVoR): Evidence for Common Descent: How we know we are apes. Evidence for Common Descent: How we know we are apes. Did we descend from apes? Are we related to all other animals? Let's have a look at what I think is one of the best pieces of evidence supporting evolution: Our DNA. Now, you may have heard that over 95% of our DNA is identical to that of chimpanzees. This is true. Depending on how it is measured, we share as much as 98.5% of our DNA with chimpanzees. The typical counter-argument suggests that this merely points to common design, and on the surface that too would sound like a plausible explanation of the data. But there is a lot more data that doesn't fit the common design picture. Before we get into that evidence, let's explore the similarities between human and ape DNA a little further. Humans have 46 chromosomes (23 pairs). Apes have 48 chromosomes (24 pairs). Each chromosome has markers on each end known as telomeres and a central marker known as a centromere. That is, except for chromosome 2 in humans. All other human chromosomes match up nicely with the equivalent ape chromosomes, except for chromosome 2. 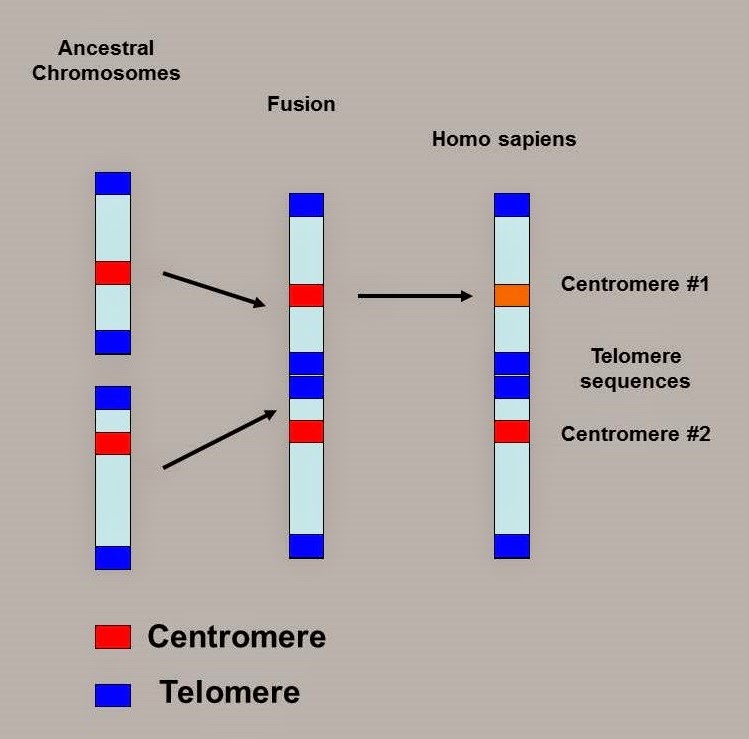 When we look closer at chromosome 2 we find that it actually has telomeres in the middle of it (as well as on the ends), and 2 centromeres as well. Looking closer again we can see that chromosome 2 is effectively 2 chromosomes fused together, and it actually matches up with two ape chromosomes. The best explanation for this is that two ape chromosomes fused together to form human chromosome number 2. You can see actual images of the chromosomes in this article. For a much more detailed and up-to-date explanation of the chromosome fusion in the human genome, read this excellent article. But this is still not conclusive evidence for common descent. This is not sufficient to rule out common design. As I am not a biologist, I am going to quote another source a lot. If you want to simply read this other source directly, you are quite welcome to do so. "In many ways, transposons are very similar to viruses. However, they lack genes for viral coat proteins, cannot cross cellular boundaries, and thus they replicate only in the genome of their host." "Replication for a transposon means copying itself and inserting the copied DNA randomly somewhere else in the host's genome. Transposon replication (also called transposition) has been directly observed in many organisms, including yeast, corn, wallabies, humans, bacteria, and flies, and recently the mechanisms have become well understood"
"Specific observed cases of retrotransposition are known to have caused neurofibromatosis and hemophilia in humans...and cancer, among other diseases"
"...finding the same transposon in the same chromosomal location in two different organisms is strong direct evidence of common ancestry, since they insert fairly randomly and generally cannot be transmitted except by inheritance. In addition, once a common ancestor has been postulated that contains a certain transposition, all the descendants of this common ancestor should also contain the same transposition." "common Alu transpositions have been demonstrated to be reliable markers of common descent in paternity cases and in criminal forensics"
"Most importantly, in the human α-globin cluster there are seven Alu elements, and each one is shared with chimpanzees in the exact same seven locations"
"Endogenous retroviruses provide yet another example of molecular sequence evidence for universal common descent. Endogenous retroviruses are molecular remnants of a past parasitic viral infection. Occasionally, copies of a retrovirus genome are found in its host's genome, and these retroviral gene copies are called endogenous retroviral sequences. Retroviruses (like the AIDS virus or HTLV1, which causes a form of leukemia) make a DNA copy of their own viral genome and insert it into their host's genome. If this happens to a germ line cell (i.e. the sperm or egg cells) the retroviral DNA will be inherited by descendants of the host. Again, this process is rare and fairly random, so finding retrogenes in identical chromosomal positions of two different species indicates common ancestry." "There are at least seven different known instances of common retrogene insertions between chimps and humans, and this number is sure to grow as both these organism's genomes are sequenced"
Could the theory be wrong? "It would make no sense, macroevolutionarily, if certain other mammals (e.g. dogs, cows, platypi, etc. ), had these same retrogenes in the exact same chromosomal locations. For instance, it would be incredibly unlikely for dogs to also carry the three HERV-K insertions that are unique to humans...since none of the other primates have these retroviral sequences." There is a LOT more information on the talkorigins website. I would strongly encourage you to spend some time there. This section is a great place to start. I also came across this blog which contains more information on this and other evidence for evolution. In case you were not able to follow the scientific details above, I will attempt to summarize it here very briefly. Certain viruses and things called transposons can affect our DNA, essentially altering parts or our DNA and/or overwriting parts of our DNA with their own, leaving a type of "fingerprint" in our DNA. In many cases, this "fingerprint" is also passed on to our descendants. Since these viruses and transposons corrupt our DNA essentially at random positions, it would be extremely rare (likely impossible) for two species to have the same "genetic fingerprint" from one of these viruses in exactly the same location in their DNA, unless they were related (that is, they both inherited the modified genetic sequence from a common ancestor). What we find is that humans and chimpanzees share many such fingerprints of retroviruses and transposons, in exactly the same positions in our respective DNA. In fact, the methods used to determine common ancestry between humans and apes have also been demonstrated to be successful in determining common descent in paternity cases and criminal forensics. This supports the common descent theory but does not fit with the common design theory. Using the available genetic data, we can even tell roughly when in history each retrovirus fingerprint was inserted into the genome. It is only in the last 30 years that we have been able to peer into our DNA and sequence the entire human genome and also that of the chimpanzee (and other animals as well). The findings from these projects have confirmed common descent so strongly that some scientists have claimed that even if we had no other evidence, the genetic evidence alone would be enough to confirm evolution.